Faye’s Monthly Planet and blog November 15th 2009 - 9/11 triggered again? November 15th 2009 – 9/11 triggered again? Since our sign of the month Scorpio, is ruled by Pluto, it is fitting to look at a something I wrote about back in 2001. It’s a cycle that can produce pretty heavy happenings. The article on the Saturn Pluto cycle is written for astrologers, but in the main it can be followed by non-astrologers. 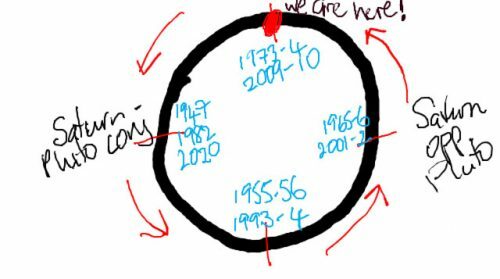 In the coming period we have the next chapter of this cycle which is exact on 15th November 2009 and then again on 31st January and 21st August 2010. So this period will be particularly active from now until after August next year. So what is this cycle? Every so often two planets form a conjunction with each other and astrologers see this as the end and the beginning of a cycle involving both planets. In previous posts I have talked of the half-way point in another cycle, the Saturn-Uranus one, when these two planets have been (and still are) opposite each other. But now we get another cycle coming into this mix. It is the 3/4 point in the Saturn-Pluto cycle. So we are in a cycle that started in 1982, had its halfway point in 2001 and is now at one of the quarter points, which are also very interesting. 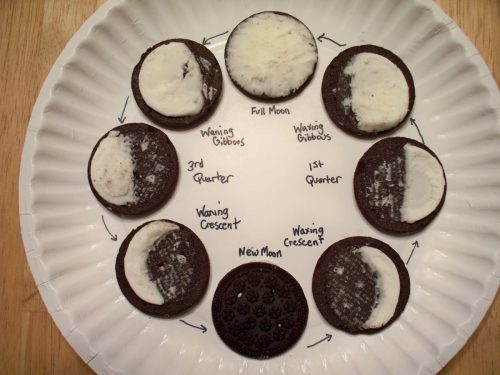 This can be compared to the moon cycle. At new moon (Sun and Moon together) a seed is planted for the whole cycle. At the waxing quarter we check how the seedlings are doing and have a chance to readjust. At the halfway point, full Moon, we reap the harvest, and at the last quarter or waning Moon, we get ready for the winter point, again the start of the new cycle. So in the Saturn-Pluto cycle we are at the waning quarter; a quiet period where we can prepare the ground for a good start again. This all might sound very symbolic, so let’s look at the last dates and the themes we are dealing with. (The article referred to above expands much further on this). Using Oreos to show moon phases! The last two start dates were August 1947 and November 1982. This is definitely a cycle associated with the economy and also with war. Pluto affects big money, pensions, taxes and the like. It is about death and transformation, power and abuse of power. It can of course be positive, but until now we have mostly seen the negative sides. Saturn is about limitations, hardships, lessons learned. Agreements, contracts and borders also fall under his auspices. Again this can be positive. However the influence of the two planets combined often produces very hard times and hard measures, albeit with clarity and reality involved. The next conjunction and thus the end of this current cycle, is not until 2020. The conjunction or start of this cycle marked the end of recessions in the past; in 1947 this was the emergence from the war years, in 1982 the end of a recession. The opposition – the halfway point – marks the end of the boom; in 1965-66 the economy had just peaked, as it did in 2001. Prior to 9/11 the stock market in the US was at a high. What seems to happen is a downturn after the opposition until the point we are at now (the square) and then the next years are used to form a solid base for growth again. This would suggest that we can start to form a stable economic base now, but that real growth won’t start again until 2020. See the website link below for an article from a well-known financial astrologer, Bill Meridian, for his views on this. As the 15th November approaches we hear many of the themes being triggered again. War in Afghanistan is daily news. Death of soldiers is high on the list of news items. The fall of the Berlin Wall has its 20th anniversary. Old wars are being relived and healed. The last of the veterans of WW1 are just hanging on in there – the last one being over 100 now. The European Union seems to respond to this cycle too. What is scary though, is that in the past week soldiers have been killed by people who were on the same side. In an environment that should have been safe this has resulted in fear (Saturn) and a shattering of trust (Pluto). The enemy can be on the same side. It may be easiest to look at the last cycle at the four points and extrapolate from there to this cycle, to see what the threats and opportunities might be now at all levels. 1947, 1955-56,1965-66, 1973-74 and the end (and beginning) in 1982. We are currently ( 2009-2010) at a corresponding point to 1973-74. The start in 1947 brought the Iron Curtain into being. Although the term had been used since the late 1800’s (in the theatre as a fire curtain) and also later in the early 1900’s, it was Winston Churchill who is credited with the idea when he used it as a geopolitical metaphor in March 1946. It is very Saturn Pluto – something which polarises (Pluto) and puts a wall (Saturn) between two systems – in this case communism and capitalism. Although the wall came down in 1989, this theme is still very relevant as this cycle is triggered again. Clashes in belief systems are the order of the day and are polarising the world. There are still two sides – goodies and baddies. The war now is against terror, not really a definable baddy so this gets projected onto Islam or some other group – choose your favourite terrorist. Or democracy good – anything else bad. In 1947 communists were hunted down and put into prison – now it’s another enemy. However in 1947 good things were initiated – the Truman Doctrine, the Marshall plan to try to rebuild Europe. And we did get television – hmm… not sure that’s all good. In Holland Queen Wilhelmina stepped down from the throne and handed over to her daughter, Juliana. A new cycle had begun. On another note, Anne Frank’s book was published opening up the truth of what had happened. This cycle does seem to bring contact with Germany, which we see again now with Angela Merkel meeting other world leaders in an attempt to heal much of what has happened in Europe’s past. Perhaps some hope here. The 1982 start and end brought more European Community conflict. Another nuclear arms agreement with the Soviets, the Falklands war and the end of a recession but it is worth contemplating what we planted for this cycle. The first square, between Saturn and Pluto was in 1955-56 which correlates to 1993-94. This is a mixed bag. In 1955-56 there was US involvement in the Suez crisis. A war between Egypt and Israel – have I heard that somewhere? There were heavy spending restrictions in the Netherlands. On the more positive side (for some) the Warsaw pact was signed around this time too. We do seem to be progressing. In 93-94, when Clinton came to power, there was an agreement between Israel and Palestine and the Maastricht treaty came into being. 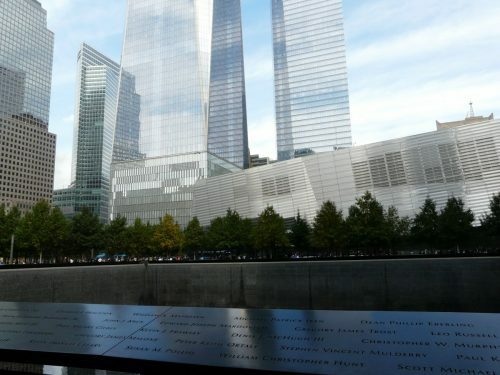 However there was a bomb in the World Trade Center in New York – yes, we tend to forget that one! Lots of banks went out of business, and the US attacked Haiti. The opposition represented by 9/11 brings 1931, 1965-66 and 2001-2002 together in the same group. This is the ‘harvest’ of what was planted at the beginning of each cycle. In 1931 the world was still in the great depression, 1965-66 saw the Vietnam war and problems within the European community – France this time. And of course 9/11 triggered the start of more wars as did events in Germany in 1939. Perhaps 9/11 was a result of something started in 1982? So now we need to take stock and get ready for 2020. On a personal level, at company level and a global level we need to look back at these dates and repair and heal things we did in the past. The opportunity is enormous, but these are heavy energies and we need to handle them consciously. These patterns can help give us clues about where to look. What can we learn from the last parallel time – 1973-74? Some examples: The oil crisis and a cease-fire in Vietnam. Nixon and Ford visited the USSR to get an agreement about nuclear arms. Watergate, and Nixon leaving office. There was an uprising in India, Germany joined the UN and there was high unemployment in several countries including Holland. And war in Egypt. The same themes do indeed seem to be reappearing. It is obviously a time when agreements (Saturn) on power (Pluto) can and should be made. We should be able to get clear contracts about nuclear power, green power, the environment, and energy in general. Also about power in the sense of who runs a country! It is also clear that anyone in power (Pluto) who breaks a promise (Saturn) will be brought to account. Saturn is about responsibility and accountability. It can be a time for cease-fires and taking responsibility and atoning for past atrocities. Germany is certainly doing this. We can bury the hatchet at all levels. High unemployment could mean that we work hard (Saturn) and retrain for our real passion (Pluto). We are already hearing of tougher measures for pensions and how to deal with the aging population (also Saturn). It is good to know that world leaders are being asked to think seriously about any involvement in wars. To redefine the goals (Saturn) and take responsibility for deaths caused (Pluto and Saturn). It is good that Obama is taking his time with Afghanistan. This is not a time for hasty decisions. We need to get the basis right at every level so we can flourish again at 2020. At every level including the personal. What do you need to get right? A very interesting book too if you are interested in the US is Jessica Murray’s Soul-sick Nation: An Astrologer’s View of America. Anyone would think that Dwight had studied the Saturn Pluto handbook: Bad Saturn = fear, bad Pluto = hate, good Saturn = respect good Pluto = trust! Power and Passion – Why do we give them up?